Did you ever have one of those days? I chose the 1½-inch pump. Drove home, dumped off the pump and headed for Hongistos. Will called. 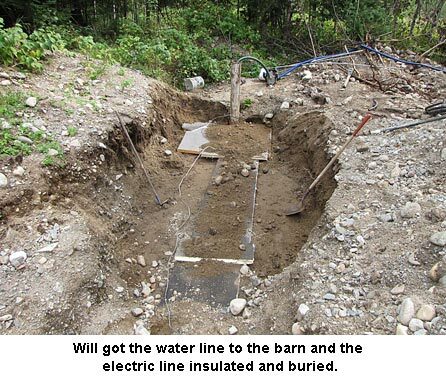 The pump worked fine, however the inside of the pitless adapter had somehow gotten knocked off and was now in the bottom of the well casing and, being brass, there is no way to retrieve it. Okay, maybe we’d buy another $60 pitless adapter and just use the inside part. As there is an L & M farm store in Cloquet, I got the belt for the swather then headed for L & M. They didn’t even know what a pitless adapter was. But finally a more knowledgeable man said the only one they carried now was a “complete” kit with a well cap, adapter, etc. $159. No way! I called Will and he made several phone calls and finally located one at Menards in Virginia (on the way home!). Only it was not a 1″ outlet but 1½”. Maybe it would work? And it was only $62; I got it. Meanwhile, he’d called L&M in Hibbing (30 miles west of Virginia) and the guy said they had the right one. So with the “wrong” one in tow, I also stopped at the L & M in Virginia, just in case. No dice. They said they’d discontinued the one Will had bought there a year back and now only sold the same “complete” kit I’d seen in Cloquet. This morning Will tried the wrong sized one from Menards. It was too big to slide into the half of the pitless we already had in place. So it was first off to Hibbing to return the pump. Then off to Virginia to return the wrong pitless adapter. Whew! All done. Will ordered the right one online. Meanwile, the blessed man picked our wild plums. They were falling off and the deer were eating them! Luckily they spit out the pits. Now I have nearly a five-gallon bucket waiting to make plum jam and harvest pits which we’ll offer on our Seed Treasures website. This is a wonderful wild plum; so sweet inside but with tart skins. They make great jam, if I ever get to it! 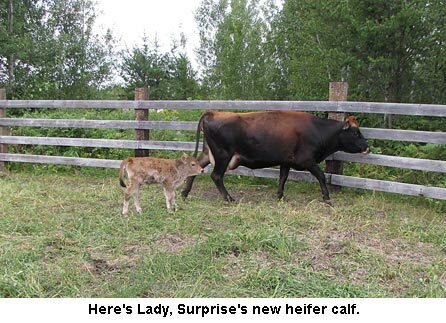 We just had a beautiful heifer calf from our half-Jersey, Surprise! I think Will wants to call her Lady and she looks like a Jersey although her sire was a Gelbvieh beef bull. (Gelbvieh is pronounced Gel-fee and is a dual-purpose German breed, bred for meat and milk as well as draft.) Lady is a beautiful little girl! 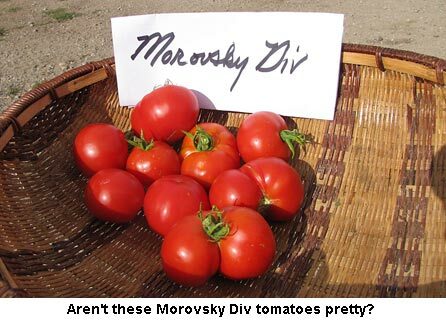 I also picked some gorgeous Morovsky Div tomatoes. These are definitely one of our favorites; smaller mid-sized, thin-skin tomatoes with wonderful productivity and flavor. They just glow! We’ve never had a better gardening year; haven’t had to water once. But now canning starts in earnest! Thanks! Yep, we’re real people who have real challenges at times. Not like the fishing shows where the guy only catches big fish, one after another, never tangling a line or having a no-bite day. Really guys….. Today is looking better already. I’m glad Morovski Div did so well for you. Maybe next year it’ll produce even more. It’s one of our heaviest producers for a fact! I’ve got to try Early Tanana. It’s a variety I haven’t heard of. Alaskan variety? Sounds like it. Anyone wishing wild plum seeds can order after checking our website, http://www.seedtreasures.com. We’re offering 15 seeds for $2.50 and if that’s all you’re ordering, postage is only $2 to cover postage and padded envelope. Your produce is looking so lovely. Deb and I are jealous!!! Jackie and Will…one of the many reasons we have enjoyed reading your blog and articles over the years is that you both are “real” people, dealing with “real” life and all the situations that it involves. Thanks again for sharing you have “one of those days”, too, in addition to providing your experienced advice and homegrown products. You are dearly appreciated!! Many blessings!! Thanks for the Morovsky tomato seeds you sent as a gift with my order. I would rate them as our second best tomato now. Early Tanana which I have grown for several years are similar size and maturity but at least in my green house are heavier producers. We had our first freeze night before last with an encore last night at 28. I got heat started in the hoop houses and the green house before it got cold. Thanks again for the seeds I will be ordering more. That was an ordeal! 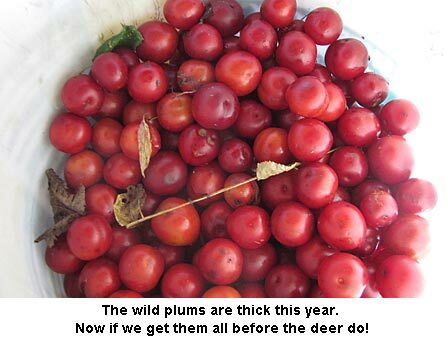 I want some wild plum seeds!